Dehaene, S., Cohen, L., Morais, J., & Kolinsky, R. (2015). Illiterate to literate: Behavioural and cerebral changes induced by reading acquisition. Nature Reviews Neuroscience, 16, 234–244. This article by Dehaene, Cohen, Morais, and Kolinsky (2015) is a summary and opinion piece on how the brain changes when transitioning from an illiterate to a literate state. It begins by pointing out that reading is a fascinating skill to study not only because it is so important to the everyday lives of both children and adults, but also because it has transformed human culture, economy, science, and law. However, up to 17% of the adult population in the United States read at or below the fourth-grade level (Baer et al., 2009). 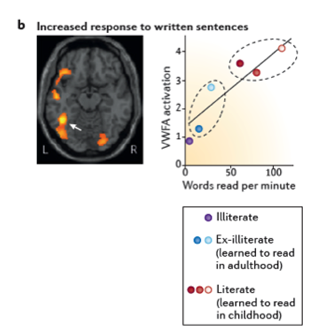 Dehaene and colleagues focused their discussion on the illiterate brain and how literacy, even late in life, can change many aspects of vision and speech processing in the brain. We have started to make research progress on the differences in brain function between literate and illiterate individuals in the last quarter-century with the advent of human neuroimaging tools, including functional magnetic resonance imaging. With these tools, we can noninvasively look at the brain when performing a task like word or sentence reading and how the brain changes based on reading ability. From these and other reading studies, we have learned that reading consistently activates many different regions of the brain, often more on the left side than the right. One important region that is consistently active during reading is the underside of the left occipital/temporal lobe, which has been termed the visual word form area (VWFA; see Figure 1 below). The VWFA is more active for text when individuals have learned to read. We have learned that children who struggle to read often underuse reading-related regions, including the VWFA. Our group is heavily invested in learning more about how the brain might work differently in struggling readers and how strong reading interventions affect this pattern. Figure 1. (a) The left hemisphere of the brain. The VWFA is shown (green oval) with other key parts of the reading brain (green spheres). (b) The VWFA activity (white arrow) is greater when more words are read per minute (a measure of reading fluency). From Dehaene et al. (2015). To understand literacy and brain plasticity, studies over the last decade have compared children and adults who never learned to read with those who are fluent readers. Unfortunately, as Dehaene and colleagues point out, there are many other points of difference between literate and illiterate people that make a simple comparison difficult. For example, adults who learn to read later in life likely have not had the same education or socioeconomic advantages of fluent readers, and yet they may still have more advantages than those who remain illiterate throughout life, creating group economic and educational differences. Adults who had some education but failed to learn to read possibly exhibit dyslexia or other reading disabilities and thus are not illiterate merely from a lack of instruction. Group differences in reading ability may be easier to match in young child groups; however, it would be unethical to delay teaching half of a classroom of children to read to have the optimal matching of conditions between prereaders and early readers. Random assignment is the gold standard in most science experiments, but studies of literacy are rarely able to use random assignment; thus, many literacy studies have groups that differ on many variables, and that must be remembered. This paper summarizes recent brain imaging studies of later-in-life literacy and offers opinions on the next fruitful paths of inquiry. Can we isolate the impact of literacy itself? Despite the methodological challenges inherent in studying late-to-literacy adults described above, many studies have tried to understand how the brain changes when someone learns to read. These studies directly influence our understanding of brain plasticity and its adaptability to instructed skills. What is the impact of reading on early visual processing? Distinguishing between written characters in our alphabet (which often vary by only small lines) and reading vastly different handwriting require strong visual abilities. Literate adults show strong evidence of a highly trained visual system that is excellent at distinguishing very small visual differences in print. These reading enhancements to the visual system may spill over into enhanced activity when viewing other visual inputs like deciding whether pictures match when they vary on only small details. What is the impact of literacy on the VWFA and ventral visual pathway? The VWFA is highly active for words in literate adults and children and shows a preference for words in their language, consistent with a visual system that is highly tuned to repeated word inputs (Figure 1). Training in reading and listening to a new language even briefly can trigger larger VWFA activity as well. Even more intriguing, recent data indicate that blind adults trigger VWFA activity when they read in Braille, suggesting that visual input is not necessarily critical, but rather that it is the linking of language with specific physical representations. The VWFA on the left side of the brain is close to a part of cortex that is highly active when viewing faces. Fluent reading skills appear to result in a remodeling of the left hemisphere, such that face activity decreases on the left and increases in the right hemisphere. It is unknown why this occurs, but it is possible that only so much space in the brain can be devoted to specific shape recognition and that educational training in reading tunes the brain to devote space to alphabetic shapes in addition to faces, resulting in this flexible and highly reproducible reconfiguration. What is the impact of literacy on speech processing? Reading affects the whole spoken language network in fluent readers—brain activity when reading can be just as strong as when listening to speech. Dehaene and colleagues summarize some of their own findings that literate adults actually have greater brain activity to speech than nonliterate adults. They propose that this finding is due to greater phonological processing in fluent readers. 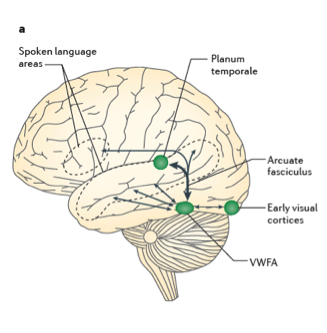 Literacy seems to enhance speech-related activation in the planum temporale (superior temporal cortex) and the VWFA. This brain activity likely relates the behavioral patterns observed in literate adults when they rhyme or make other word decisions. Literate adults show speed effects in decisions that are influenced by the spelling and visual forms of the spoken words, as if auditory words were closely linked in the brain to their written forms. Recommendation 1: Literacy influences our brain organization and creates a strong link between spoken and written language. These results remind us that fluent reading requires us to co-opt brain mechanisms that evolved for other purposes. It also means that to be a good reader, it is necessary to learn how to read. We need to teach the brain to engage vision, attention, and language mechanisms simultaneously. The reading pathways are fundamentally enhanced with fluent reading acquisition in structural and functional ways. The largest changes relate to the linking of phonological information to print. Therefore, Dehaene and colleagues support reading instruction that includes explicit phonics as the most efficient technique for engaging the brain in literacy, particularly in those who struggle with word sounds in speech. Recommendation 2: This research demonstrates remarkable plasticity in the brain throughout life but also emphasizes how much easier it is to change the brain with literacy early in childhood. Skilled reading requires a lot of exposure to print, language, and reading practice. Literacy also requires engaging, explicit instruction. Family reading and community-supported literacy programs help expose community members of all ages to printed materials and offer chances to learn or increase our own reading skills. Studies of adults who learn to read late in life reveal how adaptable the brain is, but these readers often do not obtain truly fluent reading, indicating that we should not delay teaching phonological and reading skills to our children. Frequent exposure and instruction helps the VWFA to become a rapid recognizer of print. When we have learned to read, the way in which our brain responds to language, whether spoken or written, changes, and this change has benefits for visual and language processing. And, luckily, one is never too old to reap some of the benefits that reading ability can bring.